A turn-based procedurally generated death labyrinth. 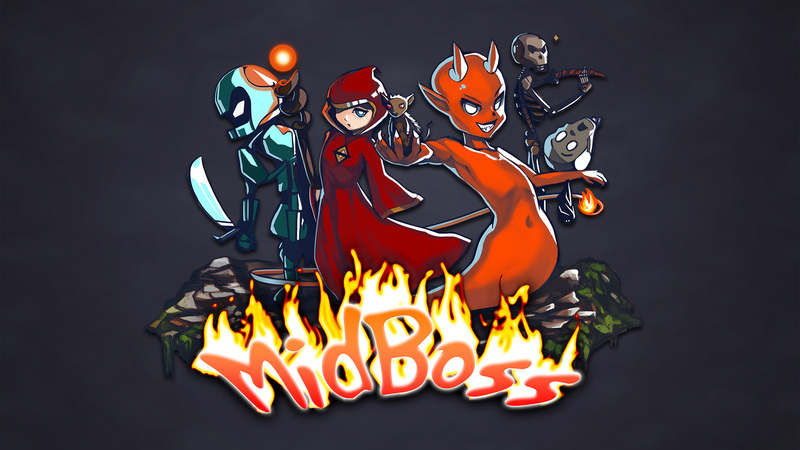 MidBoss is now available on Steam. Steam users have the option of purchasing the Original Soundtrack as well. Please visit Steam to wishlist the game. Buy MidBoss now on itch.io and you also get a Steam key! To gift a copy of the game, visit itch.io and purchase the game from there. Please visit itch.io to purchase the game. 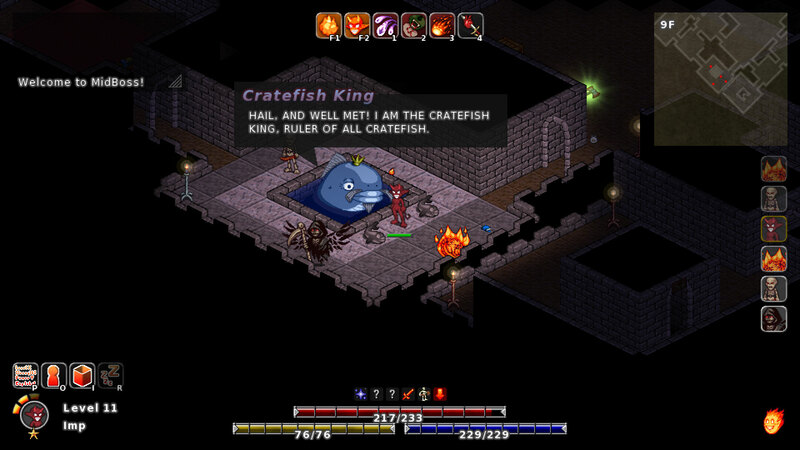 The current MidBoss version is 1.4.2(changelog), released on Saturday, March 16, 2019. Worried you'll miss an update? Don't be! The game will notify you automatically when a new version is available. Not enough information for you? Then follow @KitsuneGamesCom on Twitter or sign up to our newsletter to be notified when the game is updated. Download this 1080p MidBoss wallpaper. 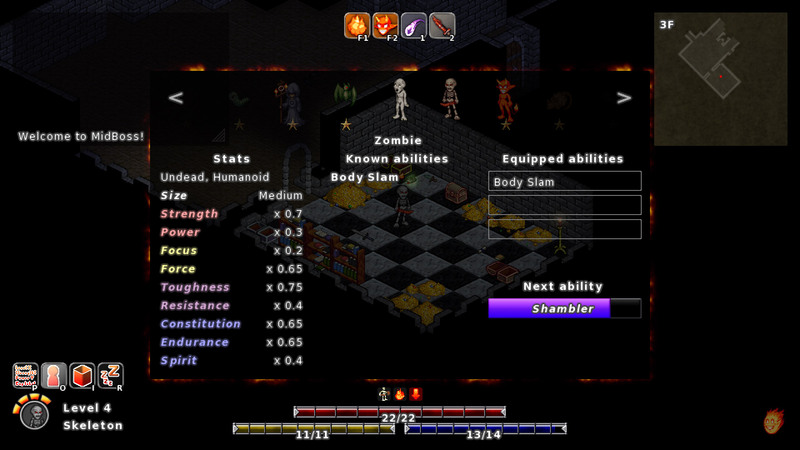 MidBoss is a video game about possessing your defeated enemies in order to become stronger. You play the weakest of the dungeon denizens, an imp with no ability other than possessing other creatures. 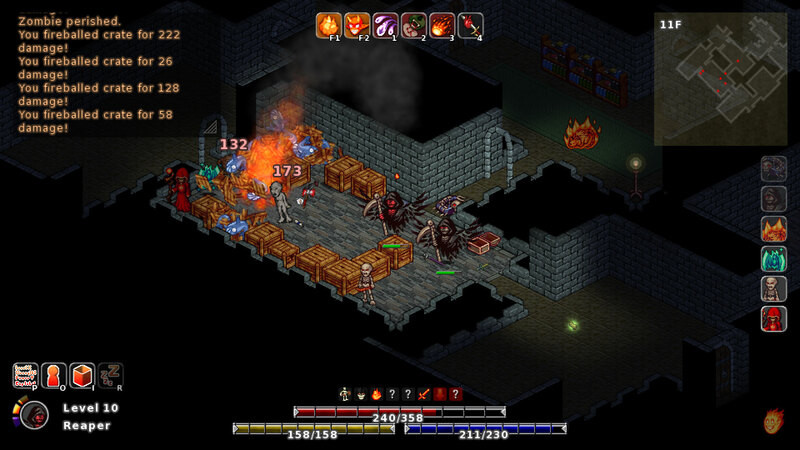 Your goal is to defeat and possess increasingly stronger creatures, unlocking their abilities for yourself and becoming stronger as you go along, and eventually defeat and become the dungeon's ultimate endboss. The game is currently available on itch.io and Steam for Windows, Mac and Linux. A press kit is available at kitsunegames.com. An absolute mess of abilities. We've got your passives, your actives, and your innates! There are over 60 unique abilities to discover and learn. Lots of equipment to find, seven types of weapons, shields, armor, boots, and accessories in 6 different rarity flavors! Dynamic music system that ups the musical excitement when enemies are about. Quick Play mode for shorter, more condensed play sessions. Custom Game mode that allows you to play the game the way you want to. 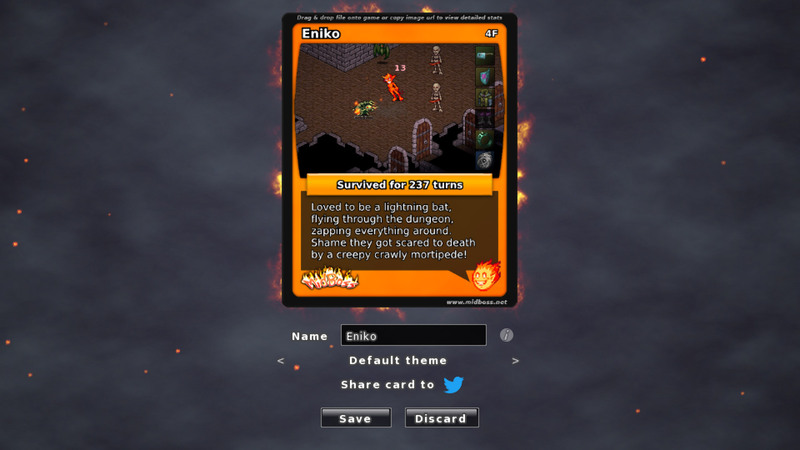 Share your crushing defeats with your friends through the use of death cards, images which contain embedded data which lets players load the card in their game, inspect your run's stats, and replay it using the same seed and settings. Spend death cards to start your next run with items you had when you died. Beat the game and get a special card which unlocks a new game+ mode. Start over with your items, abilities, or both! Traps as well as unidentified and cursed items. Trade with and sell unwanted items to a mysterious merchant. Single-file save and resume, you don't even have to click any buttons for your game to save, it's all taken care of. 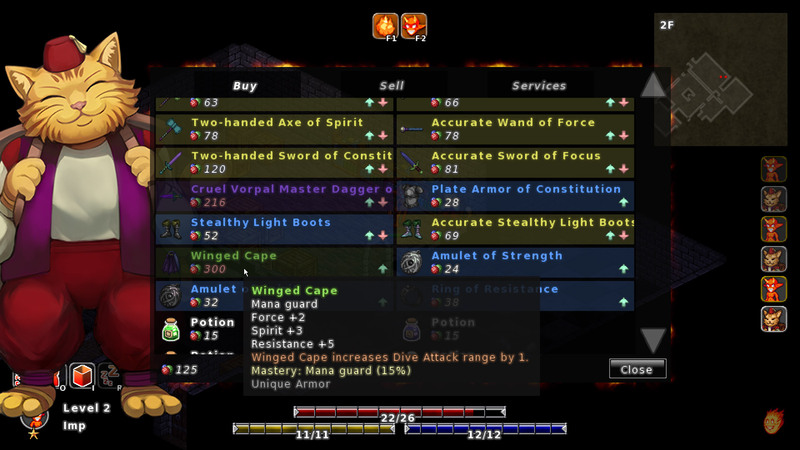 Like tooltips? We've got tooltips for everything! All the information you need at your fingertips. Lots of crates, chests, and other containers to pillage. Find the royal chest that spawns on every floor for extra sweet loot! Playable with either mouse and/or keyboard. Pick whatever control scheme you like! Line of sight and fog of war systems, and none of that cone of sight stuff. We assume you can look over your shoulder. Miss the good old days? Got some nostalgia for those eye-bleeding CGA cyans and magentas? Miss the old Gameboy days, or were you more of a C64 fan? We've got you covered with 12 unlockable retro mode filters! Initially MidBoss was developed over the course of three days for Ludum Dare #25, designed around the theme 'You Are the Villain'. People thought it was fun, and so afterwards it was cleaned up and developed further and released in March 2013. 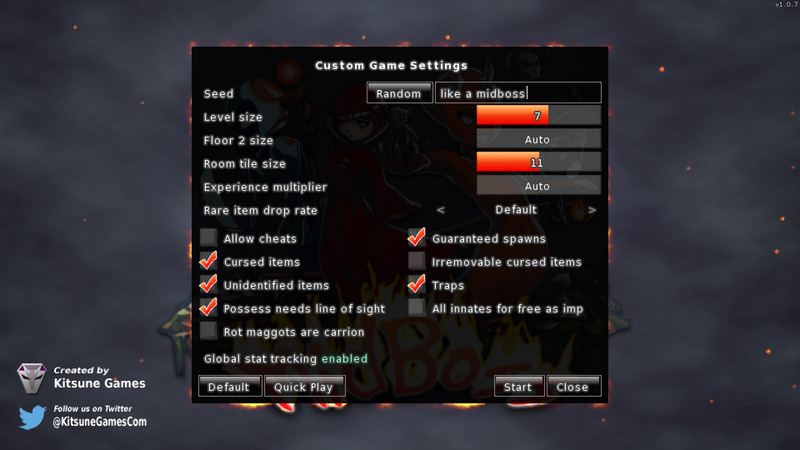 The current version of MidBoss is a complete, from the ground up overhaul of the old game - MidBoss Classic (still available to download and play) with new graphics, better interface, more abilities, more information, and a generally massively improved experience. MidBoss currently has a Discord server, a wiki and a subreddit at /r/kitsunegames. 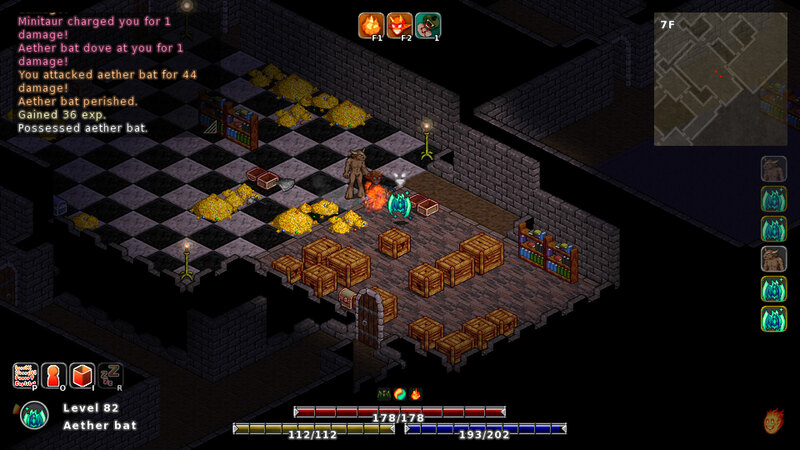 Are you a video game reviewer or do you do Let's Plays and you want to make a video of MidBoss? Check out our "do whatever you like" video license or the monetization permission for MidBoss, and drop us a link to your stuff. We'd love to see what you do!